Hawaiian rights advocates marched down Kalakaua Avenue in Waikiki by the thousands yesterday. The march was held to bring awareness to residents and visitors about issues that threaten native Hawaiian programs. Thousands of Hawaiians in red shirts overflowed Kalakaua Avenue as they marched through Waikiki yesterday to support native Hawaiian programs and entitlements. "This is an example of the Hawaiian nation building and what that nation is going to look like," said Piilani Smith, spokeswoman for the Ilio'ulaokalani Coalition. 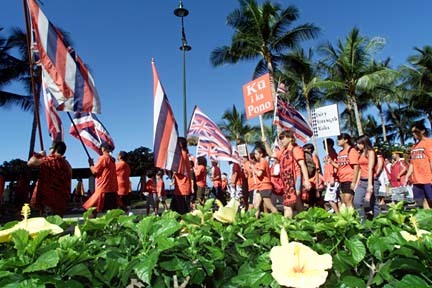 For the first time in Hawaii, trustees and representatives from alii trusts, state and civic organizations, and native and non-Hawaiian supporters joined together in a march for "Ku I Ka Pono," or "justice for Hawaiians." A sea of marchers wearing red shirts -- to symbolize Hawaiian blood or aweoweo, a school of small, red fish that is seen as predicting a big change -- flowed along Kalakaua Avenue from Saratoga Road to Kapiolani Park and spilled onto the sidewalks. Organizers estimated the crowd at more than 8,000. Supporters from the Queen Liliuokalani Center Trust, Center for Hawaiian Studies, State Council of Hawaiian Homelands and the Office of Hawaiian Affairs were among the organizations at the march. 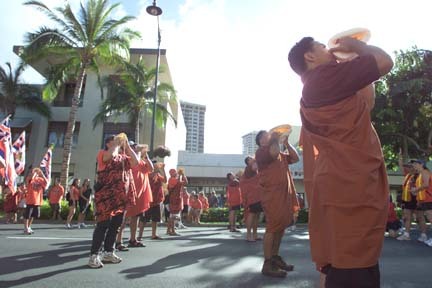 Hawaiian rights advocates blew conch shells to commence the march down Kalakaua Avenue yesterday in Waikiki. More than 8,000 people marched to protest issues that threaten Hawaiian rights. The rally served as prelude to a hearing that had been scheduled for today before U.S. District Judge Susan Oki Mollway on requests to dismiss the Arakaki vs. Lingle lawsuit. In the suit, 16 Hawaii residents challenge the constitutionality of the Office of Hawaiian Affairs and the state Department of Home Lands, alleging their programs are race-based and discriminate against non-Hawaiians. The hearing was continued after Mollway reinstated the federal government as a defendant. The change came two days after the 9th Circuit Court of Appeals upheld Judge David Ezra's dismissal of two lawsuits challenging Hawaiian entitlements. Mollway was scheduled to hold a status conference on the lawsuit this morning. "Even though it has been delayed, we are going to be vigilant and ready when that case comes up," said Smith. The march was organized by the Ilio'ulaokalani Coalition following Ezra's ruling that allowed a non-Hawaiian student to attend Kamehameha Schools while a lawsuit challenging the admission policy proceeds. Coalition President Vicky Holt Takamine said, "We have constantly been under attack of our federal programs, our homestead land, our alii trusts." "The Hawaiian community was reeling from Judge Ezra's ruling to allow a non-Hawaiian in Kamehameha Schools after his mother lied on his application," Takamine said. "The admission policy clearly states that you must prove that you are Hawaiian." A lawsuit filed on behalf of Brayden Mohica-Cummings by his mother, Kalena Santos, against Kamehameha Schools contends that the school's Hawaiians-only admission policy discriminates on the basis of race in violation of federal law. Takamine challenged those who argue that the policy is discriminatory against non-Hawaiians. "Every racial background is represented at Kamehameha," Takamine said. Annelle Amaral, of the Hawaiian Civic Club, said, "It's starting to look like a real pattern to take away Hawaiian rights, to eliminate us as indigenous people with claims and the state's intent to relegate us to a position of another minority in this place." "We will fight to keep the trust available for Hawaiians who should benefit and do need them," Amaral said. Waipahu resident Beatrice Mahealani Hiapo, who watched the march and has two children who attend Kamehameha Schools, said, "We're now ready as a people to move forward and make changes."